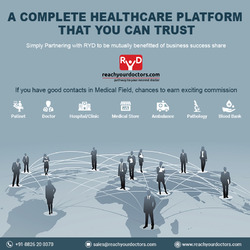 Reach Your Doctors (RYD) A complete Medical platform invites healthcare professionals to facilitate them through the use of digital technologies. This medical platform has been formulated to bring medical professionals and healthcare seekers under a roof. Doctors can register themselves and create a profile to improve patients’ engagement. Doctors can save their patients’ medical records, prescribe e-prescriptions, consult patients online or even chat with patients to prescribe medications for emergency help. Healthcare challenges faced by patients to reach doctors find a clinic congested but online medication helps to overcome such complexities for patients or even doctors.